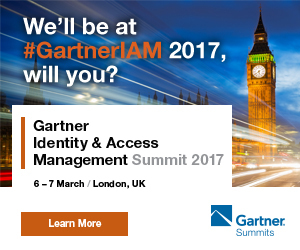 Atos through its Bull Technologies Evidian IAM Suite is a sponsor at the Gartner IAM Summit on 6-7 March 2017, taking place at The Park Plaza Westminster Bridge, London. With the new Evidian Identity Governance and Administration (IGA 10), discover how Evidian enables companies to improve their agility, enhance security and comply with regulations while accelerating their Digital Journey. The year’s most valuable information update for all matters IAM, the Gartner Identity & Access Management Summit is the premier gathering for IT and business professionals responsible for creating, implementing, and improving IAM programs at their organizations. In just two days, you’ll get up-to-date advice you need to craft and implement an effective IAM program that’s built to last in the digital age. Gain recommendations for launching a new IAM program, upgrading existing capabilities, merging programs and building IAM architectures to handle future challenges. If you haven’t purchased your pass, it is still time! As a silver sponsor, Evidian is pleased to offer you a special €325 discount off the standard rate of your full conference pass*. Register today and use discount code GSIAM17.